This is a continuation of the earlier walk from Eltham Lower Park to Heidelberg Gardens following the main Yarra Trail. Again, easy walking or riding along mainly bitumen & gravel surfaced tracks with numerous attractive rest or picnic spots. Of added interest is that this route shares part of the “Heidelberg School Artists Trail” with a number of prominent signboards displaying paintings by various artists. On leaving Heidelberg Gardens head along the signposted path to Heidelberg Park then cross Beverley Road walk past the Banyule Shared Path sign and follow the easily identifiable Main Yarra Trail. After a few minutes the path emerges on the footpath at the very busy Banksia St. Turn left past the ‘Greenery’ plant nursery and garden supplies and follow the path as it drops sharply under the road bridge to join the Yarra River. The path then passes through some trees and emerges into open parkland situated between the ‘The Boulevard’ and the river. It is in this section where a number of the paintings referred to above will be noticed some of which are located just off the main path. Eventually the Trail swings around to follow the river and pass under the Burke Road Bridge. A short while after, cross the pedestrian/cycle bridge to the signpost at the junction of the Main Yarra and Koonung Trails. Turn right at this sign in the direction indicated for the Chandler Highway and the City. Follow the Trail as it loops around through the trees and after a short walk the Trail is unavoidably forced to follow an unpleasant section squeezed artificially between the Eastern Freeway and the grounds of the Kew Golf Club. Unfortunately no alternative path is available. Eventually however after reaching and passing over Belford Road the path, after Willow Grove, drops down into more open parkland, shielded somewhat by noise barriers, from the incessant roar of the traffic on the freeway. 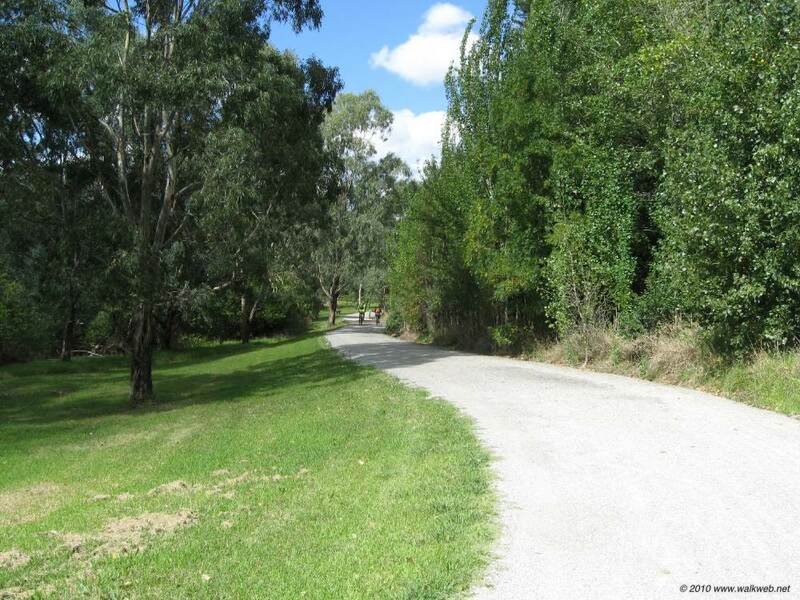 If walking it is possible to leave the main trail and head along the worn path through the very attractive grassed area alongside the riverbank until it joins up once again with the main bitumen trail below the Chandler Highway Bridge not far from Guide Dogs Victoria. Follow the path under the Bridge to a junction. Here a choice can be made to either follow the Main Yarra Trail up the steps and then right along Yarra Boulevard or alternatively, if walking, taking the path to the right through the trees along the river bank towards Fairfield Park. It is well worthwhile however to climb up the steps and follow the Trail along the Yarra Boulevard as it gives the opportunity to visit the ‘Wurundjeri Spur Lookout’ to have a brief rest and enjoy the impressive views of Melbourne city skyline. After taking in the view of the city turn right and make your way down the path that leads to the pipe bridge over the Yarra river at Fairfield. The Fairfield Park boathouse can be seen across the river and it’s pleasant setting offers an ideal spot for a relaxing drink or a meal. After crossing the pipe bridge walk up the path past the Kayak club to join the Capital City Trail in Fairfield Park the finishing point for the walk. Fairfield rail station is just a 15 minutes walk through the park, right along Heidelberg Road and then left at Station Street. Overall a pleasant generally undemanding walk mainly following the banks of the Yarra River with numerous rest spots and access points for shortening the walk or ride if required. The one negative aspect of the walk being that of the background noise from the Eastern Freeway.